Taken with Olympus E500 digital camera on July 9th 2007. Click image for larger view. I got a comment on Flickr, by BobG, that this picture would be great as a wallpaper on a computer screen. Steve, author of the great blog cyrum66, recently wanted another picture as desktop background (thanks for the donation Steve!). 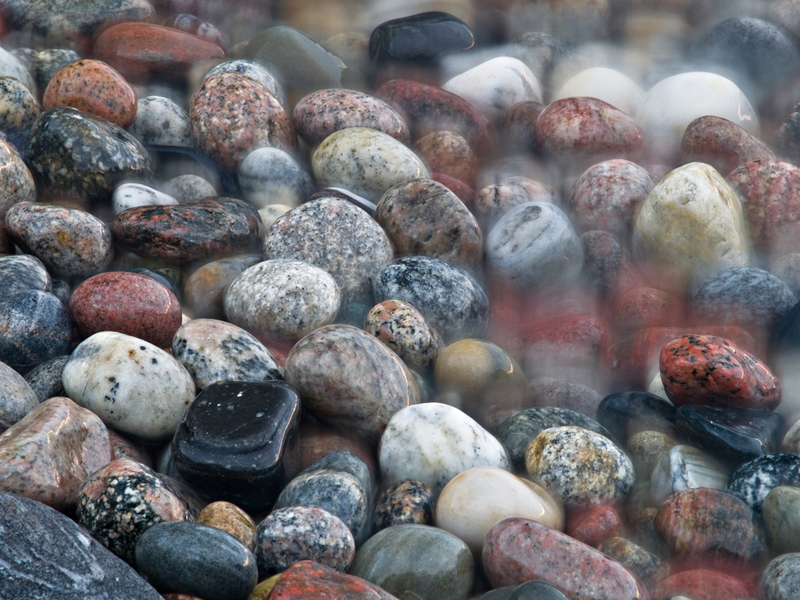 So I got the idea to make this pebble picture available as a free download. Download the 1024×768 version of the picture here. Drop me a line if you should need an even larger version. I got it up to 3264×2448. The picture is only available for personal use and should not be used commercially. I would like to hear what my readers think of this idea. Think it can make my blog more popular? What you see on the picture is me experimenting with a long shutter time. I placed the camera on a tripod and made the camera take the photo for 10 seconds so small waves would roll over some of the pebbles. This make the foggy effect you can see on the right side of the picture. Like this picture? Please buy me a film roll. great idea, and with the quality of your photos, i’m sure it will be a huge success! Love the shot!!!! I think sharing it as a screensaver is great idea….. Sounds like I should add more downloads in the future. can i use it as a desktop wallpaper? i love this photo! so so artsy! Your wallpaper offer should boost traffic: but that’s something you’ll want to test. Your pebble rocks wallpaper is beautiful, and should be quite popular with people who don’t have many icons on their desktops. Just a suggestion, but if you develop your wallpaper collection, have a few low-contrast photos, too, to give your collection variety. BTW, you gave me something to write about for “Apathetic Lemming of the North” today. Thanks! Great idea. Very strategic, you’ll be able to generate more traffic as soon as people learn about it. I think Terence’s suggestion of placing a watermark or a copyright on it is a good idea. At least you get some recognition and additional exposure to whoever use and share it. Norski: Yeah, you are right. I think many would prefer something that is less busy so it’s easier to see stuff on their desktop. I read your article. Been trying to keep focus on this site and I have yet to post anything that is not related to photos. Can be hard because sometimes I want to send out link love out to unrelated blogs that I like. Thanks for making this downloadable. I just did. Good photograph. You should think about making a google screensaver download package. I saved a bunch of your pics and added them to my G-Screensaver and they look fantastic. You’re a damn fine photographer! Would be some pretty decent link bait to boot…I’m just sayin. Interesting. You know how to make one? I just started using Google Screensaver. They have an option to choose a folder of pics from your own machine as the gallery. I’m sure with a little bit of hacking this could be compiled into 1 package for download. I’m gonna have to do some research tonight after work. I was just thinking it would be a cool thing for you to offer your readers. Like I said it looks great on my machine. A free package like this could draw new readers and help promote your site. Ok I did a little searching this morning and figured out how to use Google Photo Screensaver’s RSS option to display your photography. It’s a pretty simple process and it’s laid out right here. It still needs a little tweaking, Naming of photos and what not, but here’s one solution.